Tom Marriott brings us this detailed, illustrated account of the life and times of Jeff Crawford. Jeff started his career with the Fleetwood Flyers and eventually moved to Canada where he continued his career. This article is presented as a PDF (Adobe Acrobat) file and runs to twenty-three pages. Find out who won last week's competition that we ran in conjunction with www.patrioticgifts4u.co.uk. Two lucky winners have won a speedway mug of their choice. There's also a chance to check whether your own answers were correct. Darren Ashman sent us pictures of Bradford, Reading and Cradley Heath (all sadly now closed) that he took on trips up and down the country watching meetings. We'd love to see more pictures of Cradley Heath in particular if there are any lurking out there. "Many thanks for your program generator, it's worth it's weight in gold and among other things it saves me making a mess of the track program." "I remember the two Liverpool revivals very well. Reg Duval's 1957 promotion looked to be a winner with large attendances especially in the earlier part of the season, but the existing promotors ganged up on Duval, forcing him to pay an "appearance fee" for every rider he used in his challenge matches and not allowing him to use the names of their own clubs when they were riding at Stanley. (Belle Vue having to become "Manchester" and Coventry having to be billed as "East Midlands" etc). This was because 1957 was the year in which entertainment tax was abolished and the National League promotors didn't see why they should have had to soldier on paying this tax for so many years and then see new promotors come onto the bandwaggon and to have to pay it. Understandable up to a point I suppose, but shortsighted in the long run. Liverpool were founder members of the Provincial League in 1960 and their promotor Mike Parker was one of the main instigators in getting the competition up and running. Unfortunately, the Northern teams who joined, Liverpool, Bradford, Edinburgh and Sheffield, all chose to staff their teams with junior riders (mainly ex Belle Vue second halfers) whilst the Southern teams all brought back retired old hands. The Northern teams especially Liverpool and Bradford, proved to be no match for their Southern opponents and took some fearful home beatings all of which had a major effect on attendances. Liverpool opened the 1960 season with a crowd of over 4,000 which was pretty promising considering that the riders were only being paid 12/6 a point, but long before the end of the season the numbers had dwindled away so badly from poor results, that it was clear that the track could not survive. Again, a great shame that speedway had missed the boat in one of England's biggest cities. " Charles McKay went on a recent speedway trip to the USA and we'll bring you a selection of his photographs in the weeks and months ahead. We start with Industry Hills Speedway. We've teamed up with the good people at www.patrioticgifts4u.co.uk for this competition that allows you to win a fabulous speedway mug. Simply identify three classic speedway racejackets and you could be one of our two lucky winners. 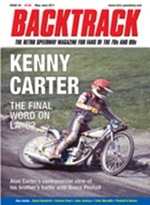 A sneak peak inside the most recent issue of the ever-popular magazine that deals with speedway in the 70's and 80's. Nick Dyer (legend of the Speedway Mail letters page) is looking for a copy of the 2009 SWC programme from Peterborough - Can You Help? 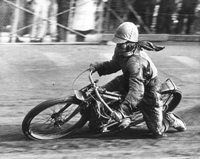 "Looks like Ian Gill could make a good Speedway rider after all. But the real credit has to go to Sam Ermolenko. He shows up year after year to these reunions. Maybe the great Ivan Mauger should learn a thing or two from Sam and do some reunions to boost the sport. That's what it's all about isn't it? Boosting the sport.. "
"Danny was awesome back in the day at Costa Mesa. I spent 10 years of my life watching left hand turning dirt rooster churning rocket pilots the likes of Alan Christiansen' the Bass Bros. with halftime entertainment from Doug Dimokos the wheelie king, and inbetween antics of Gene Gene the Dancing Machine. And who can forget the spine chingling play by play from Larry Hoffman. " "Interesting reading of the Ashington experience. I have managed to obtain a programme from the 1972 meeting, however it was not filled in." "Just watched the YOUTUBE Clip of the Speedway Museum, very enjoyable. Terry Stone did a great job at the narrating taking us through the bikes from different eras. The only niggle I've got is It wasn't long enough!! I'm sure Terry would be a great guide to take us around the whole museum and tell us a few more tales of Speedway." John Chaplin looks back on the 1950s, recalling the sport's steep decline during the decade and the reasons behind it. He also selects his 'Team of the Decade' including some of the biggest names that speedway has ever known. 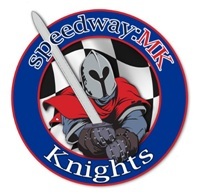 Details of a new project that will lead to the Milton Keynes Knights (complete with new modern logo) taking to the track again later this year. 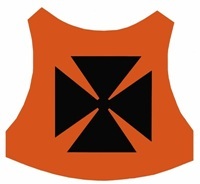 The Knights have been inactive since mid-way through the 1992 season. 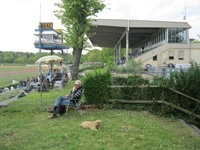 Pictures of this German circuit - courtesy of Bob Cole who visited the track earlier this year. Terry Stone is our guide to the Speedway Museum on an interesting video on YouTube. Terry's piece starts at 4 minutes and 15 seconds after some chat about vintage cars. Adrian McKinlay wishes to thank everyone who got in touch about his recent query on his father's career and those who have offered him pictures of Ken. 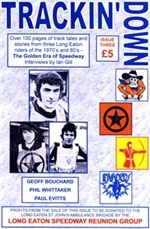 "I have read this cover to cover and yes there is enough about Speedway to keep fans happy but it's about Alan and his life/career. This is Alan's story, it's a great read and well done to him for baring his soul." "Faulty logic in this re: Mauger. Suggesting that people make a big deal about Mauger's engine failure, but it wasn't really that important because Simmo beat Mauger without trouble later - well, after Mauger's engine failure, he was no longer on his number one bike, for one thing. Furthermore, Mauger claimed that he had to race Simmo on a cold second bike. Would Collins have beat Mauger had they both been unbeaten in heat 20? It's for the gods to decide. Certainly no-one can begrudge Collins his win though - he was a worthy champion, and too good to have only won one title." "I was a regular visitor to Cleveland Park on thursday night. Great memories of some fantastic riders. I remember one thursday Roger Wright going round the outside along the back straight at Cleveland Park his clutch got stuck and he did a wheelie all the way down the back before coming to grief crashing into the fence on the corner. My father still holds quite a number of badges from there. Tim and Tony Swales were great riders as well"
"Loved the article on Long Eaton's reunion. Organising something similar for the Paisley Lions on 22 October and it was great to hear about the various bits and bobs about memorabilia, the invitees, interviews, and the like-think it would be a lot of help for anyone organising such an event. " Neil Burrows reports from the recent Long Eaton Reunion - the piece is illustrated by a dozen pictures that Neil took on the evening. Peter has been an Eastbourne Eagles fan for almost 40 years - here he selects his favourite Eagles and a few riders from other clubs too. In this extract from Trackin Down 3, Paul Evitts recalls the circumstances that led to him moving from Birmingham to Canterbury. Adrian McKinlay wants to know what number Ken McKinlay was wearing in the 1956 World Final - Can You Help? Continuing the Long Eaton theme, the Invaders new supporters club will be officially launched at Leicester on Saturday. Invaders Chris Widman and Lee Geary will be on hand to meet the fans. Membership will cost £6 for adults and £3 for kids/oaps. "Ian(Titch), Yes, you are right about Pauline & Shelley Coombes. I'm getting to "that age". Thanks for reply Bert, reasons fully understood. I remember appearing at your home in Mansewood? Glasgow circa. 1963. I was rebuilding/tuning a BSA C15 250 and had run into problems. I lived in Pollokshields and "the grapevine" informed me that one Bert Harkins was the man to speak to about motorcycles. Took the bus up to Mansewood. Lo & behold you werent in! Bet you were glad!! Still managed to get the C15 to do 65mph. Wow! I must have seen you around the old Clydesdale in the 1950s when the Cycle Speedway was on the go. I know that a certain Mr D Barrie was there at the time. All the best Bert & thanks for some gret memories."